Constellation Leo the Lion, is an ecliptic constellation laying between constellation Cancer and constellation Virgo. Leo spans 40 degrees of the Zodiac in the Signs Leo and Virgo, and contains 15 named fixed stars. Bacchi Sidus was another of its titles, that god always being identified with this animal, and its shape the one usually adopted by him in his numerous transformations; while a lion’s skin was his frequent dress. But Manilius had it Jovis et Junonis Sidus (Jovis = Roman Jupiter or Greek Zeus; Junonis = Roman Juno or Greek Hera), as being under the guardianship of these deities; and appropriately so, considering its regal character, and especially that of its lucida (Regulus). The Egyptian king Necepsos, and his philosopher Petosiris, taught that at the Creation the sun rose here near Denebola; and hence Leo was Domicilium Solis, the emblem of fire and heat, and, in astrology, the House of the Sun, governing the human heart, and reigning in modern days over Bohemia, France, Italy, and the cities of Bath, Bristol, and Taunton in England, and our Philadelphia. In ancient times Manilius wrote of it as ruling over Armenia, Bithynia, Cappadocia, Macedon, and Phrygia. It was a fortunate sign, with red and green as its colors; and, according to Ampelius, was in charge of the wind Thrascias mentioned by Pliny, Seneca, and Vitruvius as coming from the north by a third northwest. As to its antiquity there can be no doubt. JAMIESON says, “the Lion does not seem to have been placed among the Zodiacal symbols, because Hercules was fabled to have slain the Nemean Lion. It would seem, on the contrary, that Hercules, who represented the Sun, was said to have slain the Nemean Lion, because Leo, was already a Zodiacal sign. Hercules flourished 3,000 years ago, and consequently posterior to the period when the summer solstice accorded with Leo” (Celestial Atlas, p. 40). There is no confusion with this sign. 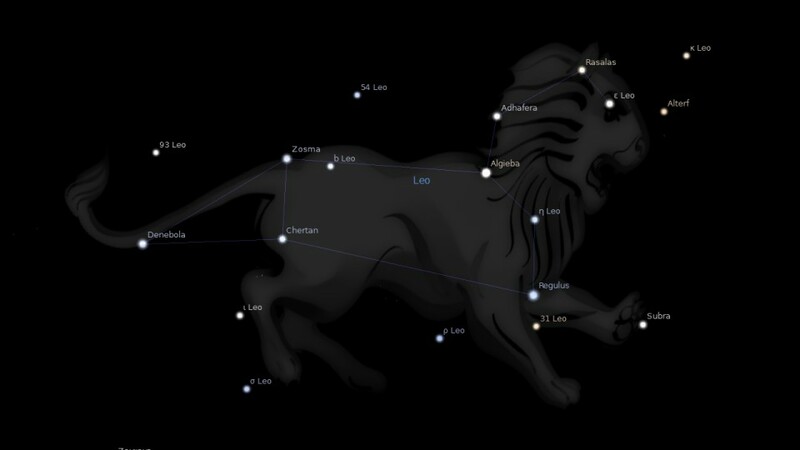 In the ancient Zodiacs of Egypt (Denderah, Esneh) and India we find the Lion. The same occurs on the Mithraic monuments, where Leo is passant, as he is in Moor’s Hindu, and Sir William Jones’s Oriental Zodiacs. In Kircher’s Zodiacs he is courrant (running); in the Egyptian Zodiacs he is couchant (lying down). In the Denderah Zodiac he is treading upon a serpent, as shown in Mr Edward Cooper’s Egyptian Scenery. Its Egyptian name is Pi Mentekeon, which means the pouring out. This is no pouring out or inundation of the Nile, but it is the pouring out of the cup of Divine wrath on that Old Serpent. The Denderah picture exhibits all four in one. The Lion is presented treading down the Serpent. The Bird of prey is also perched upon it, while below is a plumed female figure holding out two cups, answering to Crater, the cup of wrath. The hieroglyphics read Knem, and are placed underneath. Knem means who conquers, or is conquered, referring to the victory over the serpent. The woman’s name is Her-ua, great enemy, referring to the great enemy for which her two cups are prepared and intended. The Syriac name is Aryo, the rending Lion, and the Arabic is Al Asad; both mean a lion coming vehemently, leaping forth as a flame! It is a beautiful constellation of 95 stars, two of which are of the 1st magnitude, two of the 2nd, six of the 3rd, thirteen of the 4th. 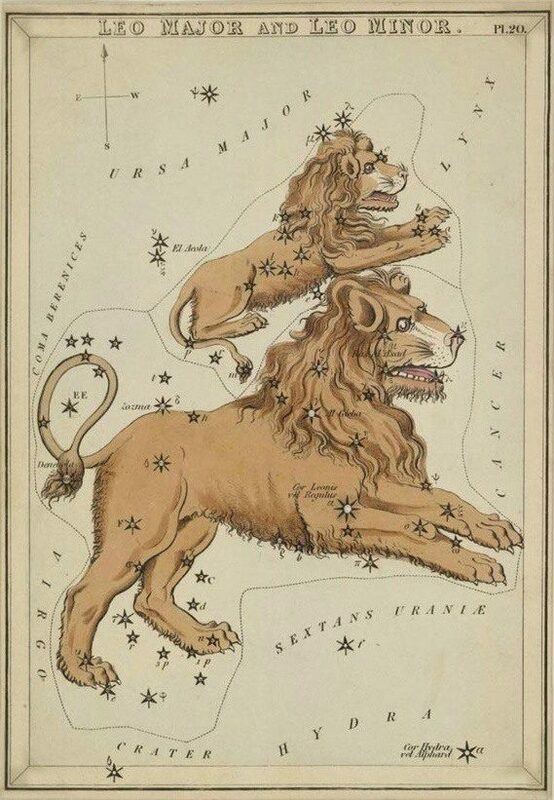 The brightest star, α (on the Ecliptic), marks the heart of the Lion (hence sometimes called by the moderns, Cor Leonis, the heart of the Lion). Its ancient name is Regulus, which means treading under foot. The next star, β, also of the 1st magnitude (in the tip of the tail), is named Denebola, the Judge or Lord who cometh. The star γ (in the mane) is called Al Giebha (Arabic), the exaltation. The star δ (on the hinder part of the back) is called Zosma, shining forth. 1. Fixed Stars and Constellations in Astrology, Vivian E. Robson, 1923, p.48. 2. Astronomica, Manilius, 1st century AD, p.237. 3. Star Names: Their Lore and Meaning, Richard H. Allen, 1889, p.252, 253. 4. The Witness of the Stars, E. W. Bullinger, 39. Leo (the Lion).